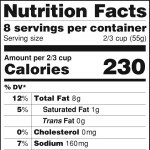 Servings per Container:This number is how many servings you can get from one package. Some containers have a single serving, but most have more than one serving per package. Probably not. Many adolescents need more than 2000 calories as they grow in height, build bones, build muscles, and stay active. The 2000-calorie diet is just an estimate and is used to help calculate the Percent (%) Daily Value listed on the food label.